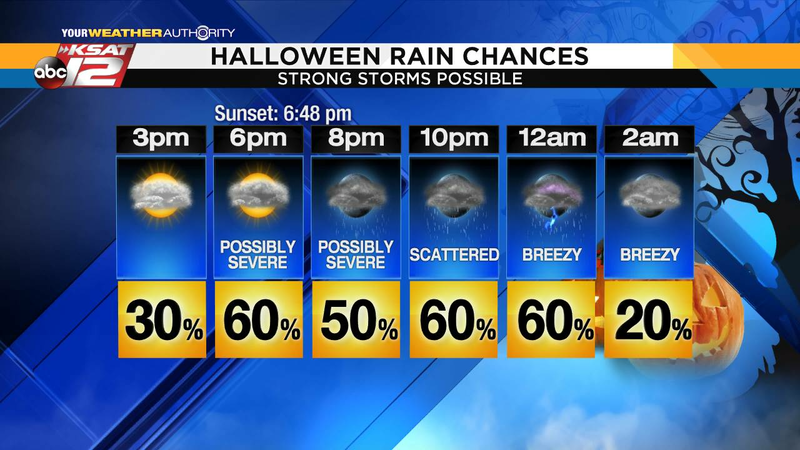 SAN ANTONIO - If you’ve been around San Antonio long enough, you know that every so often we have to dodge a few storms on Halloween. That will be the case this year as a cold front approaches South Texas late Wednesday afternoon and evening. A broken line of storms will likely develop around the evening commute and dinnertime, with the possibility of one or two of these storms being on the strong side. If a severe storm develops, it would be capable of frequent lightning, gusty winds and some hail. In order to keep from being spooked by the storms, keep the radar handy with our KSAT 12 Weather Authority app. You’ll receive notifications right to your phone, helping you stay prepared for all things Halloween! Another quick round of rain is expected after midnight, with skies clearing Thursday. The best treat of them all? It’ll stay nice through the weekend.